Dusty Montgomery captured this image in Oklahoma last year. If happiness for fly fishers is information, then the amount of information available via the internet could kill us all with an overdose of bliss. Trout, even stockers, are a bit more complex than your average largemouth bass. Stockers aren’t everywhere all the time, and if they actually have a chance to “go native” and eat from the local menu, you want to know what’s on the menu. Enter hatch charts. In an attempt to get all this information “under one roof” so to speak, I spent some time compiling the information into this single post. I hope you don’t ask, and read this first. If you don’t read this then don’t be surprised when you are unceremoniously sent HERE. Geographically speaking, we may as well start from the southern most trout fishing in Texas (and the US for that matter?). 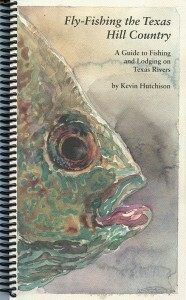 Books full of bliss have been written on the Guadalupe River and Texas Hill Country fly fishing scene. I recently ran a post on the Guadalupe River Trout Fishing, provided by and I just came across this site – Castell Guide Services, which has hatch charts for the Guadalupe River and plenty of other valuable information. Take the information from locals with a grain of chamber of commerce thinking. Central Texas and the Hill Country are the object of drought and epic flooding on what seems to be a regular basis, so know before you go. Volumes of information exist on the Guadalupe, and it continues to pile up. The “Guad” as it’s called, also benefits from the concentrated attention of Trout Unlimited and the Guadalupe River Trout Unlimited (GRTU). They do have a lease system, additional private stocking of trout and more recently they have become involved with river flow and temperature monitors. Since the Guad is a river, the TPWD does release a map showing where trout are stocked on the Guadalupe. Texas, like other states, spends substantial money to stock city ponds for events meant to get people outside and fishing during the colder months. Typically, they respond to fish kibble in a variety of power bait colors. Translation; sure you saw them being poured into your neighborhood pond, but they are going to sit in a tight school, never going native, and get yanked by the Home Depot bucketload with Power Bait. Good luck with a fly rod. 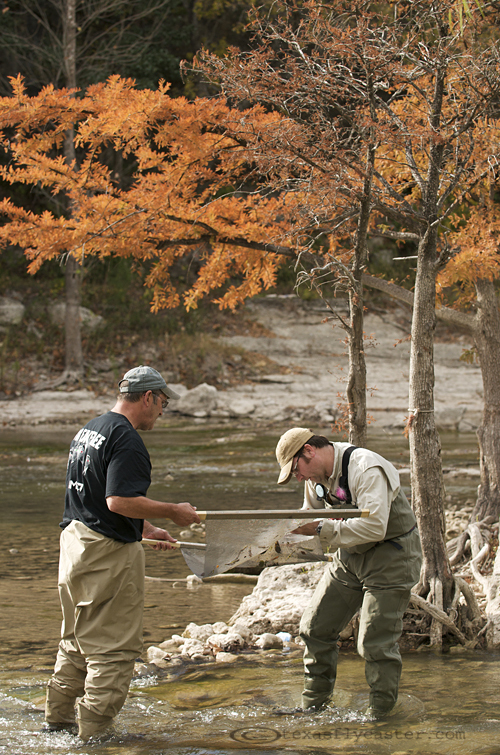 They post the Texas trout stocking information in November, but here is last year’s locations for Texas trout stocking. I think it would be safe to guess there will be significant cutbacks in Texas trout stockings. Virtually all trout found in Texas are found in these stocking situations, with the glowing exception being the Guadalupe River. In North Texas, home base for TFC, it’s just about 35 miles to Oklahoma, and Oklahoma knows that. There’s an entire industry aimed at fly fishers, and two southernmost destinations for North Texas are the Blue River and Broken Bow / Beaver’s Bend. The Blue River is seasonally stocked while Broken Bow benefits from a much longer, more intense, stocking schedule. I don’t know what kind of “tourist” dollar value has been put on these fish, but Broken Bow’s economic impact is measured in the millions. Whether by design, or budget cuts, it looks like Oklahoma will be cutting back on stocking trout at certain locations. 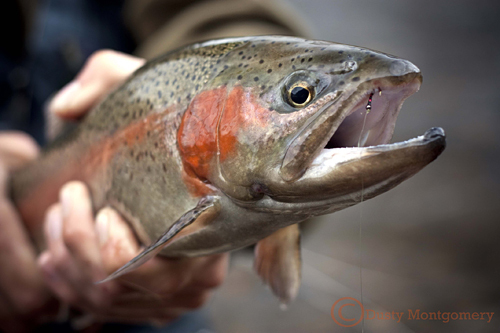 You can find the Oklahoma trout stocking schedule here. If you are headed to Broken Bow – The Lower Mountain Fork – have a look at the Lower Mountain Fork River Foundation web site. Scroll down a little on this link to see a short Broken Bow hatch chart. There’s a better one … somewhere. If you want to zero in your skills for catching trout in the nearby Lower Mountain Fork, or at the Guadalupe River, you will be well served to attend one of Rob Woodruff’s entomology classes at either, or both locations. I have done the class on the Guadalupe, and some of the basics are the same, but you will find a very different selection of trout food sources on the Lower Mountain Fork. Do yourself a favor, and DO both classes. Don’t hesitate, as Mr. Woodruff’s classes always fill up quickly. If you are looking for a shortcut to stories on both of these locations, be sure to go to the right hand column, scroll down to the search box and key in words for whatever bliss you seek.